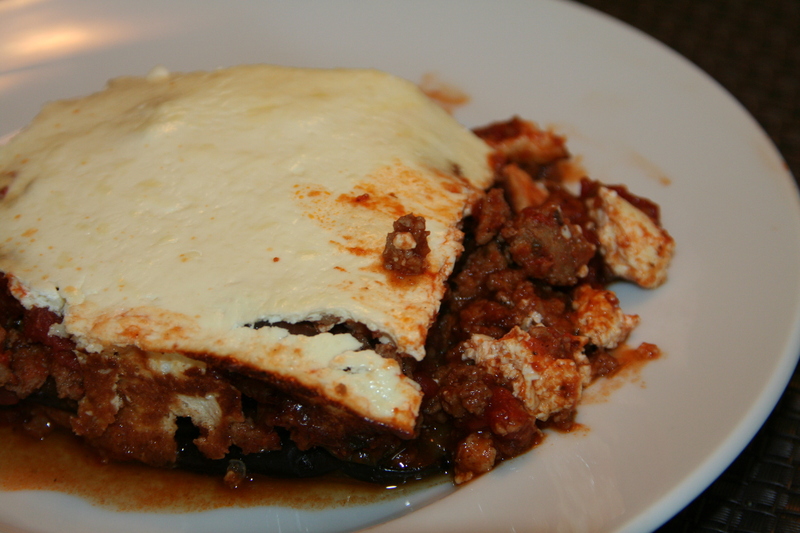 My mom loves Greek food, so I have made this dish for her several times- she loves it! The yogurt sauce topping and use of ground turkey make this a “Fit-to-Eat” version of this classic Mediterranean dish. I use Greek yogurt in lieu of straining plain yogurt, and I have made this dish with both full-fat and fat-free Greek yogurt. The results with either are great, but it is tastier with full-fat yogurt in the sauce. I also find that the need to salt the eggplant is debatable. I do salt it, but shorten the sitting time to 30 minutes – it is at least well seasoned! This recipe was adapted from Martha Stewart Living. Place turkey in a medium saucepan over medium heat; cook until browned, about 6 minutes. Using a slotted spoon, transfer to a medium bowl. Add onion, garlic, cinnamon, salt, nutmeg, and pepper to saucepan; cook until onion is translucent, about 10 minutes. Return turkey to saucepan with tomatoes, tomato paste, and oregano. Bring to a boil; reduce heat to medium low; simmer until sauce has thickened, about 1 hour. Remove from heat; stir in chopped parsley; set aside. Preheat broiler. While sauce cooks, cut eggplants into 1/4-inch slices. Sprinkle with salt on both sides. Place in a colander over a bowl; let stand 1 hour to drain. (I let it stand for 30 minutes.) Discard liquid; rinse each slice under cold running water to remove all salt and juice. Place slices on several layers of paper towels; press out water. Lay dry slices on a clean baking sheet; coat with olive-oil spray; broil until browned, about 2 minutes. Turn; coat with olive-oil spray; broil until browned, about 2 minutes more. Repeat until all eggplant slices have been broiled; set cooked eggplant aside. Preheat oven to 400 degrees. Assemble moussaka: Place a layer of eggplant on the bottom of an 8-by-12-inch baking pan. Cover with half the turkey sauce. Place another eggplant layer, then the remaining turkey sauce. Add a final eggplant layer; cover with reserved yogurt mixture. Bake until mixture is bubbling and top starts to brown, about 30 minutes. Transfer to a heat-proof surface; let sit until moussaka cools slightly and firms, about 10 minutes. Cut into squares; serve.